Is your washer leaking? Maybe the spin cycle is not working. Perhaps it won’t fill properly or won’t come on at all? Turn to us for reliable washing machine repair in Edmonton, Alberta. Our trained techs are certified to fix any problem. We have polished our skills over years of on the job experience. There is not a washer brand we won’t service. You can call us to service every make or model. We will fix or install front load and top load types. Our washing machine technician is standing by to help you now. Don’t let a broken washer stop you from doing laundry. Call us for quality washer service. Our skilled tech will pull in your driveway before you can hang up the phone. Okay, maybe not that fast. But we do offer amazing same day repair service. You can contact our pros to install or repair a washing machine. You will be happy with our rates, but you will be thrilled with the great results. You will be impressed with our same day washing machine repair service. We respond fast and work quickly. Of course, quality is our number one priority. To fix a washer, we need durable replacement parts. We keep a wide array of these items in our service van. Providing excellent service requires plenty of preparation. Our experts are prepared for success. Take advantage of our customer care commitment. Choose Appliance Repair Edmonton AB for service at its best. We promise to take great care of your washing machine. Give us a call for outstanding washer installation service. Our techs have installed plenty of these units. We offer focused service with precise attention to detail. 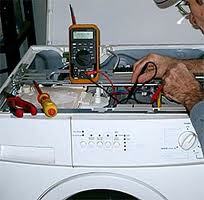 Try our company and get outstanding Edmonton washing machine repair. Our rates are low, but our quality is high.